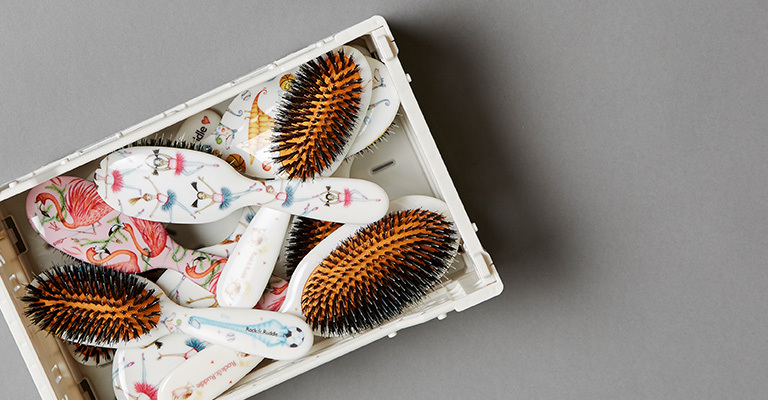 The English brand Rock & Ruddle produces beautiful quality hairbrushes, made of genuine wild boar bristles. The wild boar bristles are renowned for protecting the hair by dispersing the natural oils of the scalp evenly throughout the hair, making it shiny and healthy. The brushes are available with both 100% wild boar bristles, suitable for the youngest, but also with a combination of wild boar bristles and nylon, which makes combing long hair extra easy and comfortable. The Rock and Ruddle hairbrushes are available in several sizes as well as sweet and colourful designs for both children and adults.